To Fit . 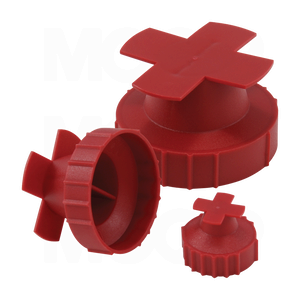 . .
MOCAP Universal Thread Plugs are designed to fit many different thread types and sizes, allowing for maximum flexibility. These Plastic Plugs are easy to install. Simply push the plug into the female threaded port and apply a small turn to lock it in place. Protects threaded components and fittings from moisture, dust and damage during production, shipping and storage. Our U Series Plugs are molded in Red polyethylene plastic and sized to fit 1/8 thru 3/4 NPT or 7/16 thru 1-7/16 UN or 1/8 thru 1 BSP or M10 thru M36 Threads. MOCAP stocks Universal Thread Plugs in many sizes for immediate shipment.